A RIPPLING SIX-pack and abs that could easily pass for an ironing board isn’t the be-all-and-end-all for heavyweight boxers, according to Hall of Fame promoter Frank Warren. Being fit and in trim along with, ideally, no surplus overspill creeping over the waistband, is, however. 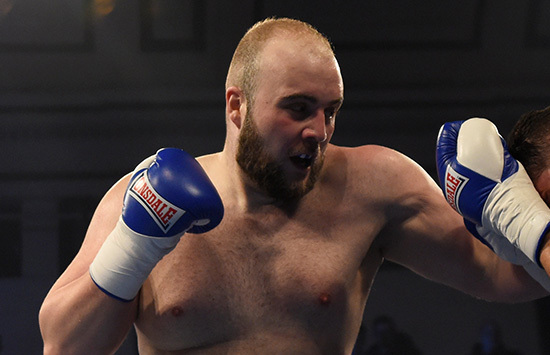 The promoter was reflecting on the rapidly impressive progression being enjoyed by one of his own Heavy Mob, namely Nathan Gorman, who blitzed the previously resolute Sean Turner in Manchester last weekend to put his marker down amongst the numerous domestic contenders. The improved physical conditioning displayed by Gorman has caught the eye of Frank, who believes removing a little excess baggage has worked wonders for the Nantwich prospect. “He is going from strength to strength, the kid, isn’t he?” purred Warren. “Again, he was a bit on the tubby side at one point. “It is not a bodybuilding contest though because boxing is not about bodybuilding. Larry Holmes wasn’t chiselled like Frank Bruno. “It is not how you look that counts, providing you are fit, have got stamina and are not carrying bags and bags of weight around as a heavyweight. How you look is not the criteria when it comes to how great a fighter you can be. “Ali put weight on, Holmes carried weight, Buster Douglas… I could talk about so many fighters. A lot of fighters who were around at the time like Bruno and Mike Weaver looked like they were chiselled out of marble. “I want to see fit fighters and what I don’t like is them piling on loads of weight in between fights. That is the difference between training for a fight and training to get the weight down. “Nathan has done well, he’s got fast hands and I like what he does when he comes off the ropes and slips. He is not one of those who just slips off the ropes, he slips and makes you pay by clipping you. In closing, Frank couldn’t resist a little gaze into the future and the prospect of Nathan trading bombs with a London heavyweight who is starting to make a big name for himself. NATHAN GORMAN WASN’T the only undercard attraction to catch the eye of the promoter on the night of Tyson Fury‘s return to the heavyweight arena. ‘Kid Dynamite’ by name and explosive by nature, Mark Heffron looks to be a middleweight who is going places. Frank – who also name checked Liverpool super welterweight JJ Metcalf for his impressive claiming of a WBC International title – didn’t dare blink like the rest of us when the combustible operator from Oldham took to the ring against Andrew Robinson. “He is an exciting kid who did really well and I have always rated him,” stated Frank after watching Robinson being spared further punishment in the sixth round by referee Ian John Lewis. “A few more fights and he will be up there in some big fights. He is a good kid, he is exciting, he can punch, he can box. “After being warned by the referee for a low blow he just went at the fella, took him apart and did what he had to do. Robinson is normally a tough guy too. THE FORMER MMA star Jack McGann demonstrated on his opening night that he might just have what it takes to make a name for himself in the boxing ring. The new super welterweight addition to the ranks stopped Dwain Grant in the third of six scheduled rounds in Manchester. Of course, to those of a certain generation, someone with the name McGann coming from Liverpool might just ring a bell. Remember those four acting brothers from the city – Paul McGann probably the best known, for landing the lead role in long-running BBC sci-fi drama – who regularly popped up on our TV screens from around the mid-eighties? Well, according to Jack, they might just be a family connection. Long-lost family is not Jack’s only claim to extended fame because he counts a very famous actor from the here and now as a friend – the brilliant Tom Hardy. “We’ve got a mutual friend and a few years ago Tom started sending me videos and stuff wishing me luck for my fights,” added Jack. “It went from there and now I am his mate and I talk to him a lot and he is very supportive of me.